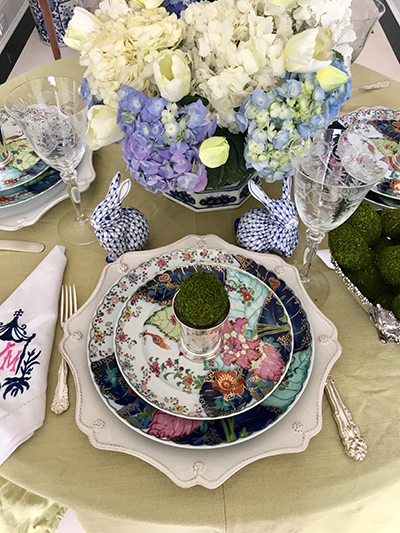 When you’re done checking out my outdoor spring tablescape, visit my blogging friends whose links are at the end of the post. 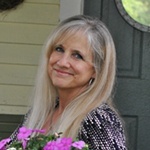 We’ve all gathered together for “It’s All Set,” a monthly table setting blog hop organized by Lory at Designthusiasm. 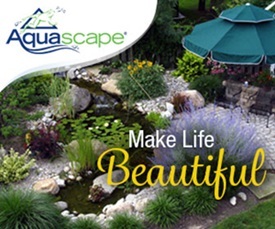 When dining al fresco, re-think your outdoor living spaces. 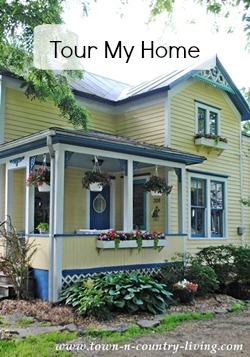 Rather than dine in the backyard, I thought the porch would create a sense of coziness with a bit of romance. I simply moved the kitchen table out here – it’s light and small. 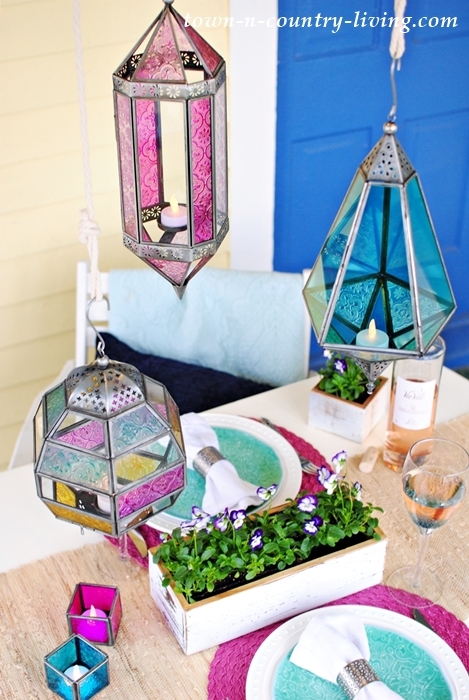 Moroccan-style lanterns from World Market lend an international flavor to the table setting. As the sun sets, the LED votive lights will cast a cozy glow. 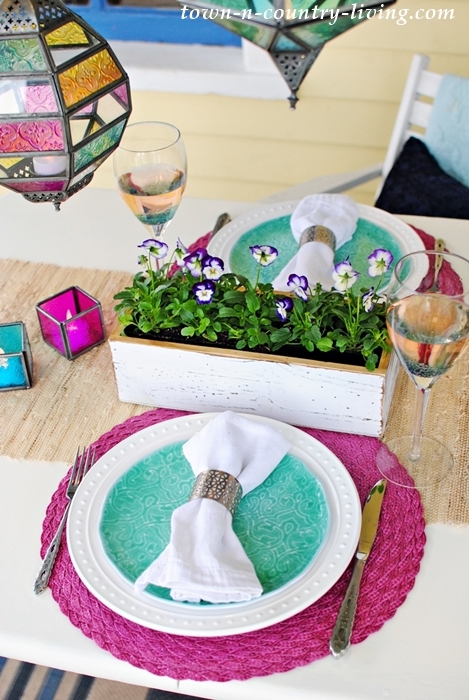 I pulled jewel-toned colors from the lanterns when choosing place mats and melamine plates. 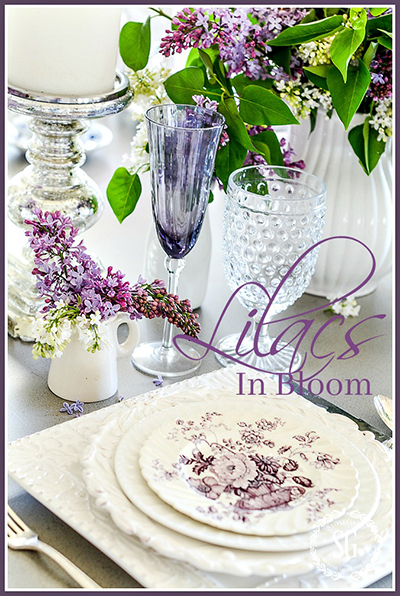 A simple centerpiece of violets in a shabby chic box adds fresh appeal without taking attention away from the hanging lanterns. A natural table runner lends texture. 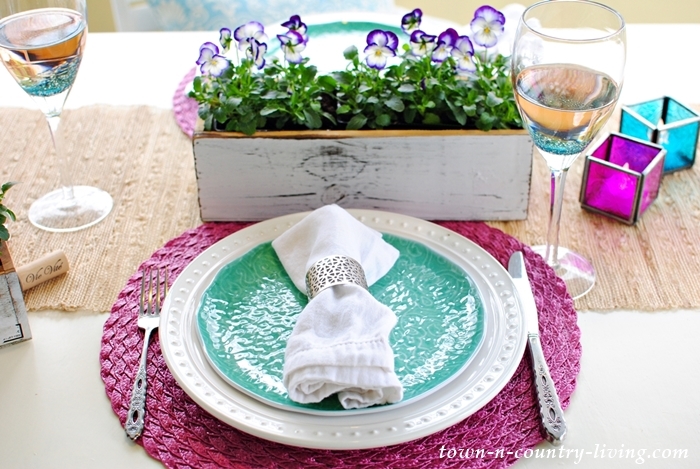 When dining al fresco, it’s always good to enjoy a little vino with your meal. 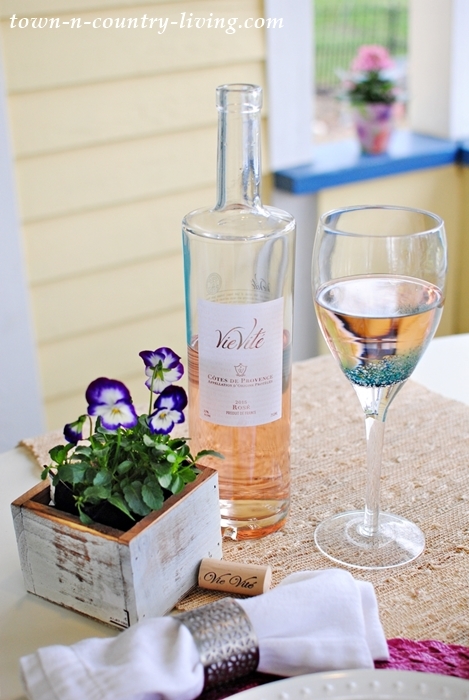 I chose a Rose wine to add just a touch of pink inside the wine glasses. 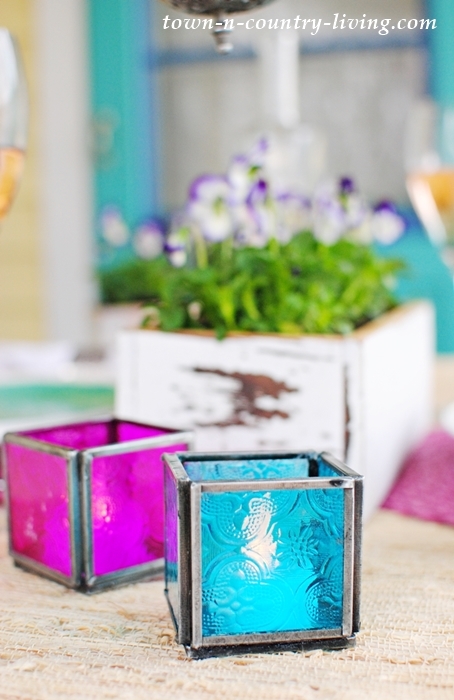 A pair of jewel-toned candle holders add a bit of ambiance and repeat the color scheme. The wine glasses have just a bit of blue at the bottom of the goblet. 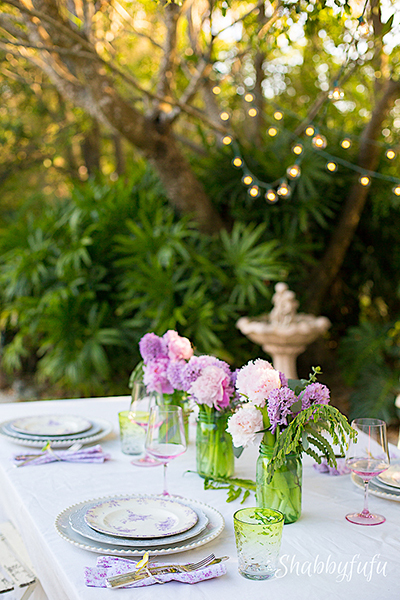 Spring is a good time to dine outdoors before mosquitoes and other critters arrive. And if it rains – no problem. With spring porch dining, we have a roof over our heads. 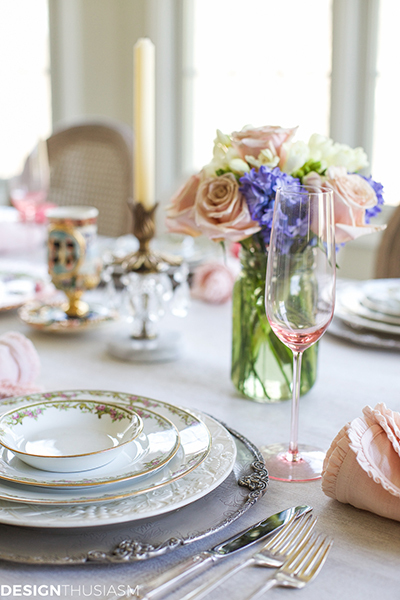 For more spring table setting inspiration, visit my blogging friends below! Those lanterns were made for you! It’s gorgeous. You had a really pretty idea with the colorful dishes and the lanterns. 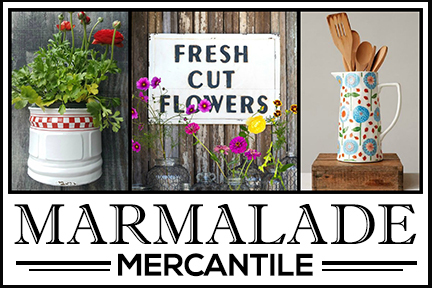 Aren’t the new melamine dishes just wonderful? I was in Pier 1 yesterday and actually had to touch the glassware and dishware in order to see if it was melamine or actually was glass or “china.” I’m definitely old enough to recall the old melamine and Wow, it’s come a long way. You used it beautifully. Beautiful setting and the lanterns add some whimsy. I like to eat on my porch when weather permito. You have a colorful and lovely place to dine. 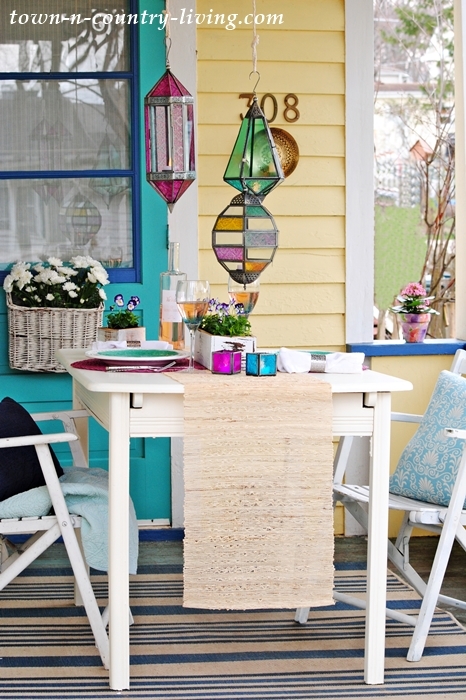 Love the lanterns and colorful table. Very inspiring setting! 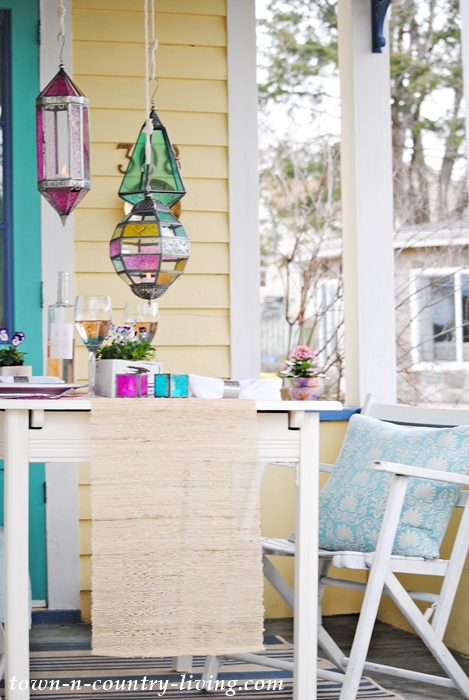 Your Spring Boho porch theme is so cheerful and welcoming. 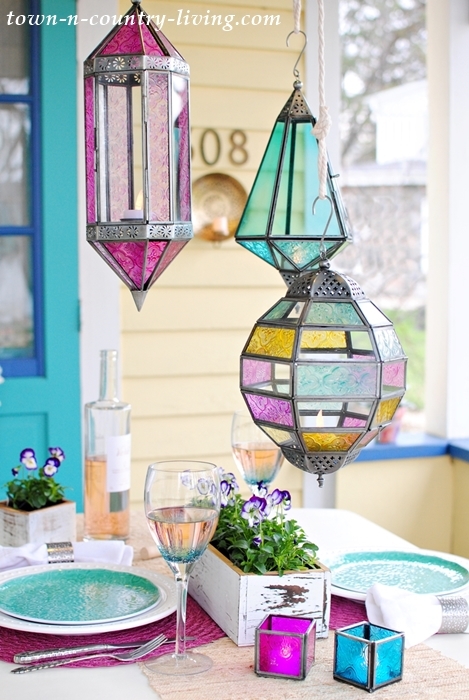 The colors scream spring and those lanterns are adorable. It all looks so charming.